Our product range includes a wide range of fep/pfa lined diaphragm valves. 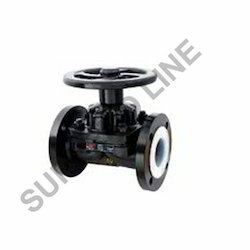 We have established ourselves as one of the renowned manufacturers of Diaphragm Valves. These valves are designed with utmost precision with the aid of premium quality materials and sophisticated technology. Characterized by excellent sealing and isolation characteristics, these valves have gained much appreciation from the customers.